Ross, Jane. "Grain Elevators". The Canadian Encyclopedia, 24 April 2015, Historica Canada. https://www.thecanadianencyclopedia.ca/en/article/grain-elevators. Accessed 21 April 2019. Southern Alberta (photo by Richard Harrington). Built in 1929 by three brothers, the first elevator in the Margo, Sask.\r\ndistrict was privately owned and still standing in 2006 (courtesy of Oscar Johnson Jr). Pyramidal-roof elevator, Namaka, Alta (courtesy Provincial Museum of Alberta, PN98.68.8/photographer unknown). Slipform concrete high throughput, Smoky River, Alta (courtesy Provincial Museum of Alberta, PN98.42.847/photographer: Judy Larmour). The logistical problem of getting producers' grain into railway boxcars was first addressed by farmers shovelling their grain into two-bushel sacks, which they then transported to a loading platform along the rail line. There, they emptied the sacks into a waiting boxcar, a back-breaking and time-consuming job. The industry needed a means of storing and shipping grain quickly, and small, one-storey wood frame warehouses erected by farmers were inefficient. 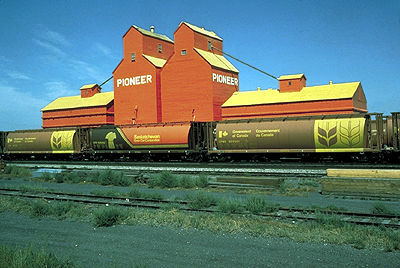 The Canadian Pacific Railway (CPR) demanded larger, vertical warehouses that could take advantage of the fluidity of grain, especially when acted upon by gravity. To elevate the grain a mechanism known as the "leg" was devised, an endless belt with cups or scoops attached. It was the leg that gave grain elevators their name and determined their shape. By offering free land rental the railway encouraged private companies to build standard 25,000-bushel elevators complete with a leg driven by a steam or gasoline engine as well as equipment to clean grain. 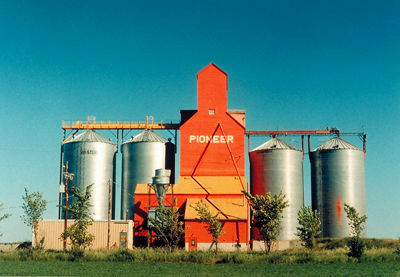 The hundreds of standard grain elevators built to these specifications ensured the uniformity of the cultural landscape. All elevators, despite variations in shape and bushel capacity, shared three architectural elements: the elevator, the driveway and the office/engine room. Grain companies drew up building plans, but often contracted out the construction. Building the framed cupola and driveway once elevator is completed (courtesy Provincial Museum of Alberta, PN98. 3.3/photographer Gerrit Top). A dozen men might be needed to build an elevator. The crew would arrive on site prepared to stay a month or more. Its first job was to lay the cement foundation pads, followed by the walls. Because grain can weigh up to 60 pounds a bushel it was extremely important that the elevator be made strong enough to withstand the lateral pressure placed on the bin walls. The crew's last job was to paint the entire structure. Until the late 1960s all elevators were painted CPR red except those that were metal clad. Afterwards, companies chose corporate colours to identify their elevators. 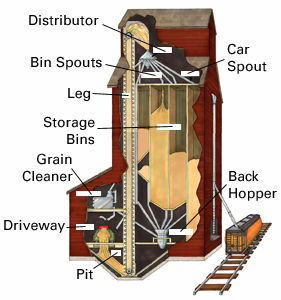 This diagram shows a cross-section of a grain elevator. Refer to the text for an explanation (courtesy Provincial Museum of Alberta). 1: Grain trucks are driven onto a receiving scale in the driveway. 2: The grain is dumped into the pit, or boot. 3: The agent selects a bin and starts the motor that powers the leg. 4: As the grain is carried over the head of the leg it is dumped into the distributor. The agent directs it to the appropriate bin spout that sends the grain into a pre-selected bin. 5: To ship grain, the agent opens a bin so the grain runs into the back pit. The grain is then re-elevated and deposited into an overhead bin. From there it is dumped into the garner and hopper scale for weighing. The grain is then lowered into the back pit from where it is re-elevated and dropped into the car spout. 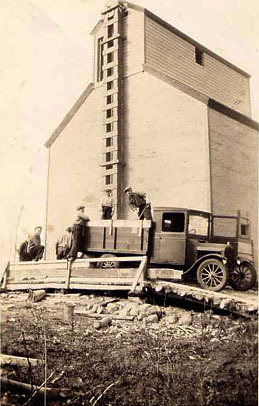 Despite the CPR's demand for standard elevators, there was considerable variation in profile, height and storage capacity of the earliest elevators, especially in Manitoba. 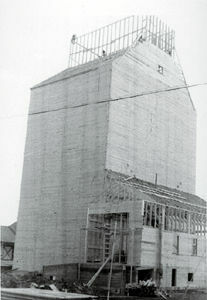 William Hespeler, in Niverville, Manitoba, constructed the first grain elevator, a wooden, silo-like building, in 1879. A more familiar form made its appearance in 1881 in Gretna, Manitoba, when Ogilvie Milling Company built a wooden, square, 25,000-bushel elevator. While companies like Ogilvie preferred an elevator with a pyramidal roof and a centrally located pyramidal-roofed cupola, others opted for an offset cupola. Others chose a gable roof with a gable-roofed cupola. By the 1920s, most companies were building the standard, or traditional, 30,000 to 40 000-bushel elevator with a gable roof and a gable-roofed cupola. Elevators were typically 24 m high or higher. No other building dominated the skyline as did the elevator. Crib annex, Camrose, Alta (courtesy Provincial Museum of Alberta, PN98.65.10/photographer: Sylvia Engen). Annexes, permanent and temporary, were built to add storage capacity. Rectangular wood crib annexes, usually with a gable roof, were designed as permanent facilities. Most were constructed as separate buildings but, in the late 1920s, some were adjoined to the elevator. Early crib annexes held approximately 30,000 to 35,000 bushels; those built in the 1950s held 60,000 bushels. Another permanent type of annex was the twin elevator, an older, smaller elevator that was moved alongside a newer, larger elevator. Many older elevators escaped demolition by being twinned in this way. The balloon annex, which appeared in the 1920s, was designed as a temporary facility. A one-storey wood frame building, it was not as sturdy as a crib annex, and tended to sag after a time — hence the term "balloon." Also temporary was the loxstave annex, which was built during the Second World War. Its octagonal structure was also not as strong as other annex types and has largely disappeared from the landscape. A traditional elevator with metal bin annexes, Elk Island, Alta (courtesy Provincial Museum of Alberta, PN98.105.23/photographer Gordon Lariviere). A more recent annex type is the metal bin. Typically holding 30,000 bushels, bins became common in the 1970s. Not compartmentalized as are other annexes, metal bins are most cost effective for large volumes of a single type and quality of grain. Elevators were constantly upgraded as new technologies were introduced. Original gasoline engines were replaced with electrical equipment; truck-dumping mechanisms were improved; larger scales and larger and longer movable loading spouts to facilitate the loading of freight cars were installed; wooden legs were replaced with metal ones; and new driveways to accommodate longer trucks were constructed. A town's “Railway Avenue” boasted an architectural landscape that included a row of elevators, railway stations, water towers, pump houses, stockyards and freight-loading ramps. All were indicative of a way of life that revolved around prairie rail transportation. Consolidation of delivery points in the late 1950s made the construction of larger facilities necessary. Wood composite elevators incorporated annexes for a capacity of about 175,000 bushels. Their familiar design ensured that they blended into their communities. They were built until the mid-1980s. Vegreville, Alta (courtesy: Provincial Museum of Alberta, PN98.27.30/photographer Parke Dobson). The first major change in elevator design came in the late 1970s. 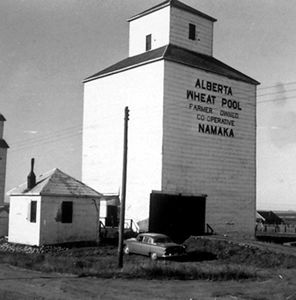 Experimenting with new designs and new materials, the Alberta Wheat Pool constructed a 170,000-bushel, pre-cast concrete "Buffalo slope" elevator at Magrath, Alberta, in 1979, followed in 1982 by a "Buffalo 2000" built at Lyalta. 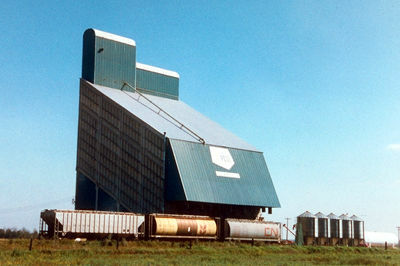 A 90,000-bushel steel elevator with two steel bins of 30,000 bushels each was built at Etzikom, Alberta, in the 1980s. 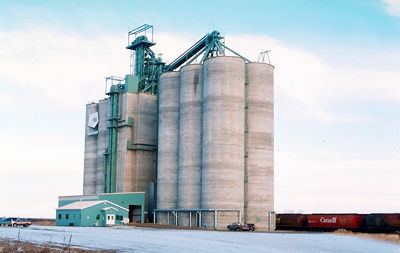 In the 1990s, grain companies concentrated on building concrete silos designed as high capacity terminals. Handling close to 50,000 tonnes, these behemoths can load a freight car in less than 10 minutes, ensuring that an entire train of 52 cars can be loaded in a single day. This capability means that the terminals have to be built far beyond town limits. Once rising above the horizon every 12 to 16 kilometres the grain elevator is fast disappearing. As early as the 1930s, falling farm incomes led to rural depopulation. In the 1950s, rising expectations, improved roads and mechanized farm equipment accelerated this trend. Although the rail network and the primary elevator system remained stable, fewer people working larger farms meant that many small branch lines became unprofitable. Rail companies sought permission to abandon them. Deregulation of the railways and the demise of the Crow Rate in 1996 have led to major rail line abandonments. Amalgamation of grain companies and "saw-offs" (the sale or swap of elevators to mutual maximum advantage) have also reduced the number of elevators. Demolition firms hired by grain companies use track hoes and occasionally explosives to bring down the elevators. Bleak though the prognosis might be for the survival of the traditional grain elevator, not all elevators will disappear. Prior to the 1990s a number were sold to producers for personal storage. Companies re-adapted others to bulk fertilizer storage. Today, heritage groups seek to preserve elevators. For example, in Inglis, Manitoba, the federal government has designated a row of five elevators a National Historic Site. 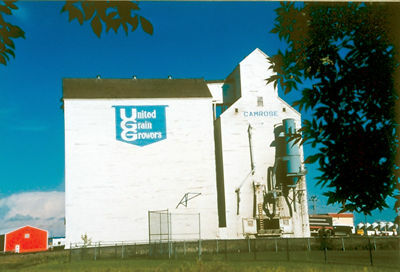 Terry Johnson and Brian Milne, "Twilight of a Prairie Icon," Canadian Geographic (September/October 1997); Lisa Mahar-Keplinger, Grain Elevators (1993); Brock Silversides, Prairie Sentinel: The Story of the Canadian Grain Elevator (1997).